Ribery: "Much better in the second half"
Munich - FC Bayern München's players were satisfied with their second-half display in the 2-0 home win over Hannover 96, while the visitors were left disappointed after failing to capitalise on a solid start. Franck Ribery: We didn't play very well in the first half - it's always difficult coming back after an international break. We were much better after the second half, we played with a lot more energy and movement and scored our goals. We won, which is the most important thing. David Alaba: The second half was much better than the first. We struggled to get into the game but deserved to win in the end. Toni Kroos: We know it's not easy playing after an international break - a lot of players were involved in those and played two games. Hannover put up a good fight and played well. We knew we had to improve in the second half and that's what we set out to do. It worked and we deserved to win overall. Didier Ya Konan: We had some chances and I think we were a bit unlucky. We have a game against Augsburg now and winning that is the most important thing. Leon Andreasen: We had a plan to stay tight at the back and play on the counter-attack, and we were good in the first half. But Bayern are a good team; it's not easy to defend against them. 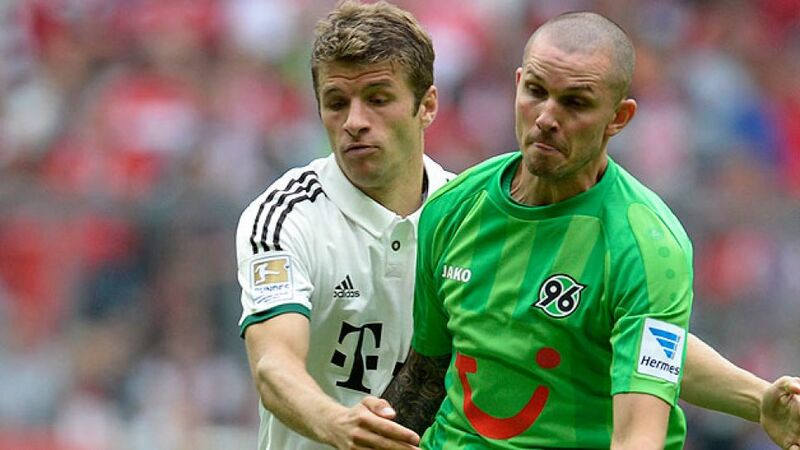 It will be just as difficult to play them in the [DFB] Cup.